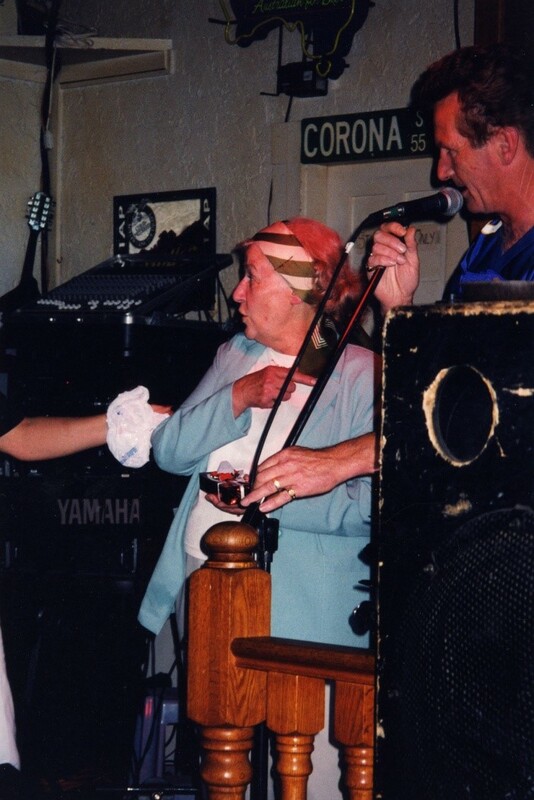 It was either late winter 84 or early 85, when Alpha Barr took over hosting the jams at the Cassidy Inn – she was 54. She continued hosting the jams until Ron Ganderton bought the place and tried to turn it into a blues house. She was 73 or 74 when that happened. “Mom comes from a musical family that never thought you could ever be too old to learn a new instrument. Everyone in her family was musical in one way or another. Mom told me that she learned to yodel when she was about 10 or 11. She and her neighbour friend, Mary Gomerich, would hurry home after school to listen to a Bellingham radio station that featured a 30 minute country music program at that time. Backing up a tad… Mom was born in South Wellington on December 9 1929. Many country musicians remember with fondness the Saturday afternoon jams at the Cassidy Inn with Alpha. She made sure every musician was signed up to play, beer tickets were doled out to those who did – and a chance to win $10.00 in the musicians draw didn’t hurt either. I remember a jam or two that ran pretty much straight through from 3:00pm – closing time. Mom (Diane) in the kitchen was sending out food for the band members. Congratulations, Alpha on reaching 80. I guess the secret is to keep on singing – I’ll give it a try. way to go mom ,from jimmy. Actually, Alpha was 77ish when Ron Ganderton bought the Cassidy. She denies having told me that she was 73 or 74 at the time. I thought “surely it wasn’t THAT long ago!” Oh well. I’m not sure whose memory is fading faster … mine or hers. I doubt many of the musicians and patrons knew how vital the Cassidy jams were to Mom’s (Alpha’s) well being during the years when Dad was sick and after his death. Once a week she got to be Alpha the musician, singer, yodeller instead of the mother, wife, caregiver and worrier. 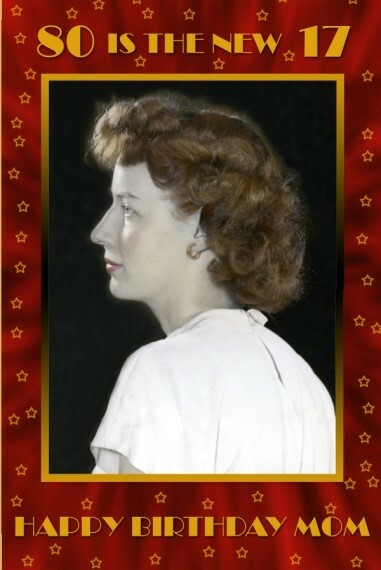 My very profound thanks to all of you who have kept my mother young! When I first met Alpha at the Cassidy in 1984, I was a folkie ,just discovering country music. Family Tradition was playing the day that Phil Brown introduced me to my first country jam.Alpha and her husband, were so kind and encouraging. They used to pick me up on Tuesday nights for the ‘accoustic” jam.There I was introduced to a whole new world. 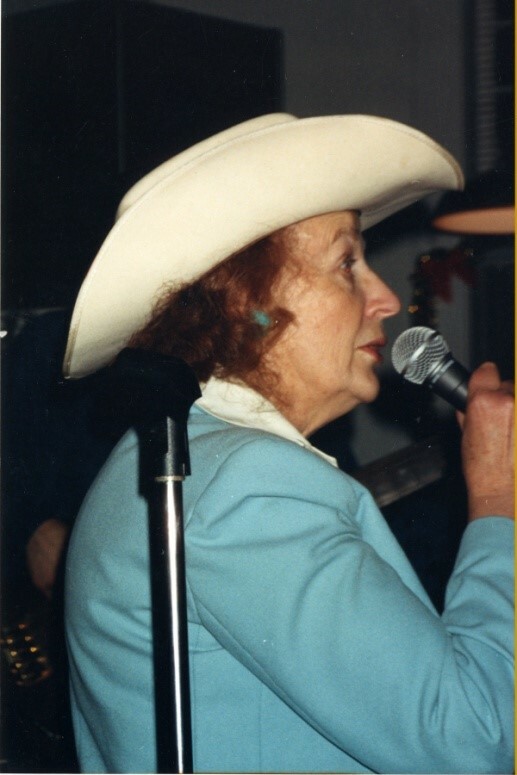 I met Lavina, Hank Stone,Reg, Sherry Lynne, Jan and Bruce, as well as many other musicians that gave me encouragement.Alpha, always kept the musicians in line and made sure that everyone got up to play.She is the Queen of Country music on the island as far as I am concerned. Lavina, I remember your beautiful voice, and also how kind you were to a newbie! Alpha was easily the best host at the best jam on the island. I loved playing the jams with Alpha in control, ending with everyone singing “Will the circle be unbroken”. She was even ok with the raunchier, rockier side of the Gypsy Heart band. So many fond memories and I am so thankful to have shared in that experience. Alpha has a very dear spot in my heart.